October HotNews – What Makes Warmzone Snow Melting Systems Better than Others? Radiant heat snow melting systems are easy to customize and can be installed in just about any time of medium and application. Snowmelt systems are versatile and can be custom designed to heat driveways, loading docks, ramps, bridges, steps and more. But did you know that Warmzone custom designs your snow melting system according to a wide range of variables, including the specific weather trends in your region? That’s right; the design process goes way beyond the basics of square footage, available power and budget. Your heated driveway is carefully tailored to provide the best and most cost-effective snow melting results according to the typical weather conditions in your area. Some of the factors considered when designing a system include the average winter temperature, average annual snowfall, project application, layout demands, and the medium used (i.e., concrete, asphalt, pavers). Just like the snowflakes they melt, each heated driveway system is unique. Despite having the same general layout, a snow melting system at the top of a ski resort is going to differ from a heated driveway down in the city. After the snow melting components have been selected and the system has been carefully designed, the next step is to make that design come to life with a proper installation. NOTE: It’s important to understand that no matter how brilliant the system design may be, the performance of the system hinges on the correct execution of every aspect of the installation. Knowing that the proper installation of these systems is so important, Warmzone provides free installation training and installation support services. We stand by our customers throughout the installation process to help ensure that the system is properly installed. Prior to the installation training, it’s helpful for installers to take advantage of the information available on our website. In addition to a wealth of online product documentation and illustrations, Warmzone hosts a vast resource of instructional videos. This valuable resource can help installers gain a better understanding of the systems, how they are installed, and how they function. Next, the installer should sign up for training. Warmzone’s free installation training courses can be scheduled through our website. Installers can sign up for a time that is convenient for them and then receive personal instructions via WebEx. Installers are also welcome to attend free training courses at our Salt Lake City facility. The course takes less than an hour and the attendee can ask as many questions as he/she sees fit. When laying out the heat cable for the system, it is vital to maintain proper spacing so that the cables never touch or cross over each other. Typical spacing for a heated driveway is either 4 or 3 inches (37 or 50 watts per square foot). For concrete pours the cable should be secured to the remesh using zip ties. Mesh-Up plastic supports should be placed under the remesh to keep the cable elevated in the cement slab. Ideally, the heat cable should be about 2 inches from the surface of the driveway or area to be heated. The cable’s power lead is then run to the control panel. (The splice must remain embedded in the concrete.) Because electric snow melting systems feature no moving parts, they require no maintenance. An aerial-mount and a ground-mount snow sensor activation device. 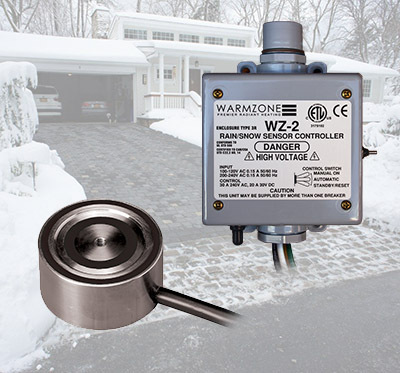 When snow is detected the sensor signals the controller which then sends power to the heating cable, warming the driveway surface. After the storm, the “afterrun” function keeps the system running for a short period to dry the surface so that no ice forms. 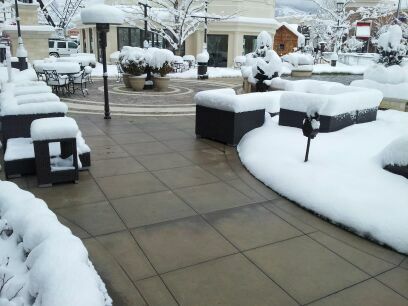 Radiant snow melting systems have proven to reliably and efficiently provide snow melting around the clock. Owners can rest easy, knowing that the snow melting system is keeping the driveway and/or walks free of snow and Ice. For more information about Warmzone snow melting, roof deicing or floor heating systems, contact a radiant heat expert today at 888.488.9276.